STEUBENVILLE, Ohio - Twenty teens and adult leaders from the First United Methodist Church recently attended a weeklong mission trip in Steubenville, Ohio. Partnering with YouthWorks, the team was divided in half between work projects and Kids Club activities. Kids Club allows local children a place to come in the afternoons to play games, learn about the Bible and get a meal. The work projects team helped to paint a house, worked at the marina and a local park, and picked up trash in some of the communities. Everyone had the opportunity to minster to people at the local nursing homes. 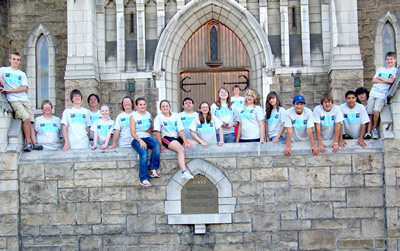 The teams were housed at the First Westminster Presbyterian Church in Steubenville. Brad Waggoner, minister of youth and children, led the team. Other adult leaders were Kathy Beals, Pat Eastin and Dan Young.